Ancient tombstones from the Kamakura Period. 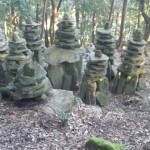 Today is an unusual tour, visiting some fascinating sites in extremely remote and difficult to get to areas in the forested hills of the eastern part of Okazaki. You will need hiking boots or good walking shoes, a flashlight, rain gear and drinking water. A reasonable level of physical fitness is required for this tour. We begin with visits to the terano-no-ookusu and kiriyama-no-oosugi. Massive and mysterious ancient trees. Both are revered, are more than 1000 years old, and need to be seen by anyone venturing into these valleys. We next visit Hakusan shrine in Sakuraijichou, before entering the hidden valley of Kirikoshichou. Part of Okazaki, this almost totally abandoned valley once contained a thriving agricultural community, evidenced by the hundreds of stone retaining walls and abandoned farmhouses. Our destination here is the Susanoo Jinja, with its massive hinoki (cypress) trees, the kirikoshi-no-meoto hinoki. These two great trees tower over the shrine, and form the torii. 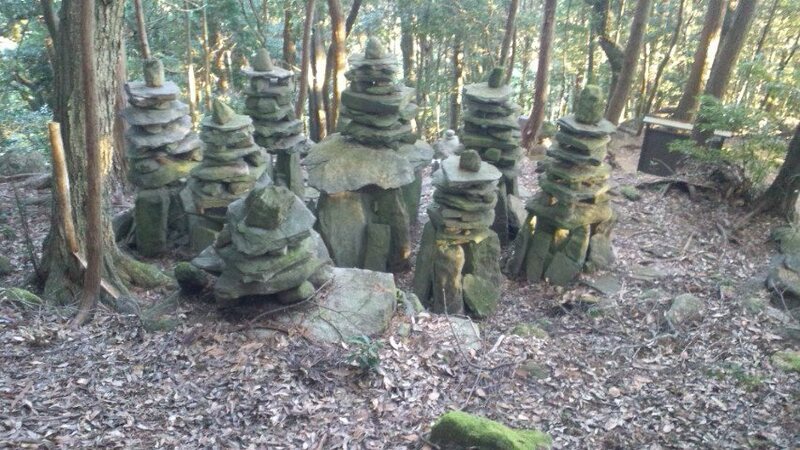 As part of our Indiana Jones routine, we will hike to the 8 faced gravestones of the Honma family (descendents of the Heike, the graves date from the early Kamakura period). In the winter this valley is home to monkeys and serow, but in the summer months the valley has many fireflies. Our final destination is the nearby Natsuyama valley, visiting the Natsuyama Hachimangu. This is an ancient shrine, and a fire festival has been held here annually since the Kamakura period. The waters of the stream are exceptionally clear, and it is here that we will enjoy watching the fireflies. Bring a few snacks with you as there are no convenience stores or shops in these remote areas.